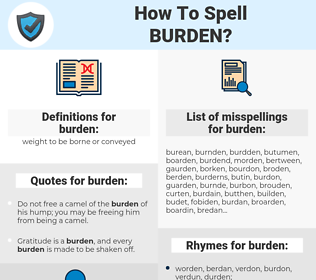 What are the misspellings for burden? What are the common mistypes for burden? What is the definition of burden? What are the usage examples for burden? What are the quotes for burden? What are the rhymes for burden? What are the translations for burden? 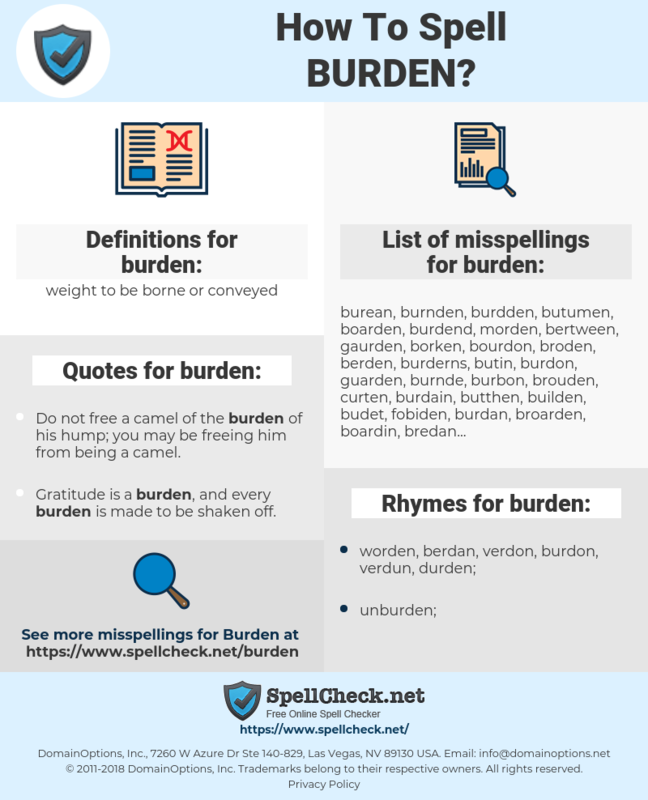 What are the common typos for burden? This graph shows how "burden" have occurred between 1800 and 2008 in a corpus of English books. Do not free a camel of the burden of his hump; you may be freeing him from being a camel. Gratitude is a burden, and every burden is made to be shaken off. The alternative minimum tax was designed to prevent the very wealthiest Americans from overusing certain tax benefits to avoid most of their tax burden. No burden is so heavy for a man to bear as a succession of happy days. 荷, 负荷, 包袱, 负累, 捞什子. Belastung, Ladung, belasten, Schwerpunkt, Charge, Last, Hypothek, Gewicht, Refrain, Gemeinkosten, Ballast, Traglast, Tragfähigkeit, Kehrreim, Tragkraft, Tonnage, befrachten, beschweren, Cargo. 負荷, おにもつ, にやっかい, 首枷, 荷厄介, 荷物, やっかいもの, ふたん, お荷物, 御荷物, 厄介者, にもつ, くびかせ. problema, responsabilidad, carga, cargar, molestar, fardo, agobiar, peso, molestia, gravamen, coste, encargo, estribillo, lastre, sobrecarga, sobrecargar, agobio, estorbo, arqueo, encargos.